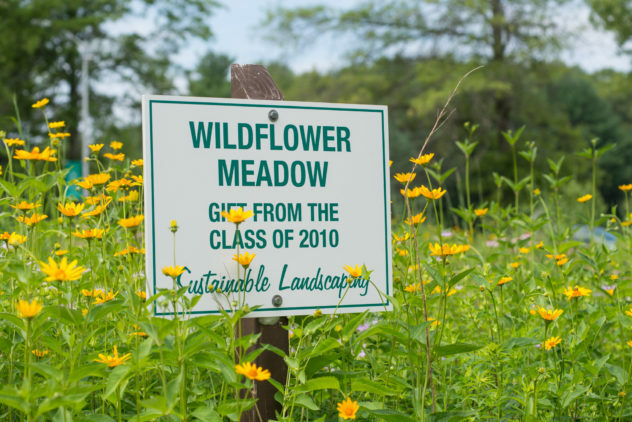 Mas­sas­oit seed­ed its 17,862.91 square foot Wild­flower Mead­ow in the sum­mer of 2010. The mead­ow, pre­vi­ous­ly a reg­u­lar­ly mowed lawn, was a gift from the 2010 grad­u­at­ing class and a sig­nif­i­cant addi­tion to Massasoit’s sus­tain­abil­i­ty efforts. Today the mead­ow is home to over three dozen native plant species and pro­vides impor­tant habi­tat to native wildlife. Addi­tion­al­ly, the mead­ow pro­vides an ide­al study site as part of Massasoit’s native bee research project, launched in the sum­mer of 2014. The his­to­ry of New England’s land­scapes pro­vides con­text for the impor­tance of Massasoit’s mead­ow. A mead­ow is a type of habi­tat dom­i­nat­ed by herba­ceous (non-woody) plants and sup­ports plants and ani­mals that require open and sun­ny envi­ron­men­tal con­di­tions. His­tor­i­cal­ly, Mass­a­chu­setts was dom­i­nat­ed by old-growth East­ern decid­u­ous forests. By the late 19th cen­tu­ry, Euro­pean immi­grants had cleared much of these forests for farm­ing and wood. (Har­vard dio­ra­mas) The rock walls built by these farm­ers can still be seen through­out New Eng­land, includ­ing in forest­ed areas. As peo­ple moved to the cities, the aban­doned farms quick­ly suc­ceed­ed into forests. While most of New Eng­land pre-Euro­pean set­tle­ment was forest­ed, patch­es of mead­ow occurred due to nat­ur­al dis­tur­bances, such as storms and fires, and anthro­pogenic dis­tur­bances, such as cut­ting and burn­ing by Native Amer­i­cans for farm­ing and hunt­ing. How­ev­er, due to the lack of small-scale dis­tur­bances, such as fires, mead­ows have become increas­ing­ly rare, leav­ing organ­isms that require this stage of suc­ces­sion with­out habi­tat. Thus, Massasoit’s mead­ow is an impor­tant, if small, ecosys­tem in the over­all land­scape. Massasoit’s mead­ow is not quite estab­lished, as it is still young. In the ear­ly stages of estab­lish­ing a mead­ow, the peren­ni­al mead­ow plants can be out­com­pet­ed by annu­al weeds, which are adapt­ed to take advan­tage of dis­tur­bances, like exposed, dis­turbed soil, where they grow and repro­duce quick­ly. A mature mead­ow is a mix­ture of peren­ni­al grass­es and wild­flow­ers, with root sys­tems that some­times extend over 10 feet into the soil. This means plants are able to absorb water and nutri­ents in peri­ods of extreme heat and drought. In addi­tion, the bio­mass of the plants above ground shade the sur­face of the soil, which helps reduce the growth of annu­al weeds. There­fore, mature mead­ows require very lit­tle main­te­nance. Mead­ows are main­tained by fre­quent dis­tur­bances to keep woody plants from estab­lish­ing. How­ev­er, since bison and fires are hard to come by on cam­pus, we use mow­ing. At Mas­sas­oit, we mow in the spring for sev­er­al rea­sons. First, we want to leave the plants stand­ing dur­ing the win­ter to pro­vide food and cov­er for wildlife. Sec­ond, most mead­ow plants are heat-lov­ing, so they flower from mid-sum­mer through the fall. If we wait­ed until lat­er in the sum­mer to mow, we would slow their growth and keep them from repro­duc­ing. And final­ly, most annu­al weeds seed ear­ly in the year, so by mow­ing before they seed, we can reduce future weed out­breaks. Replac­ing part, or all, of your lawn with a mead­ow is a great way to make your land­scape more sus­tain­able. Once estab­lished, it will require no water, fer­til­iz­er, or her­bi­cides, and will only need mow­ing once a year. If you are going to use a seed mix, be aware that not all of them are cre­at­ed equal. For exam­ple, while well-mean­ing, Chee­rios’ “Bring Back the Bees” cam­paign seed mix­ture not only con­tained intro­duced species, but also includ­ed doc­u­ment­ed inva­sive species. The same is true for many gen­er­al wild­flower seed mix­tures found at hor­ti­cul­tur­al cen­ters. For more infor­ma­tion on estab­lish­ing a wild­flower mead­ow please vis­it this link.